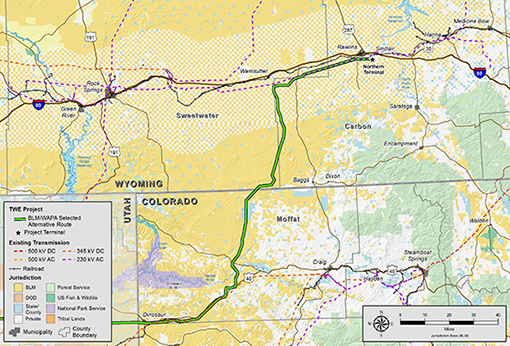 Oct. 17, 2018 – TransWest Express LLC is developing the TransWest Express Transmission Project, which crosses about 92 miles of Carbon County and Sweetwater County in Wyoming. Following the completion of the federal environmental analysis process, TransWest is now pursuing a permit from the Wyoming Industrial Siting Council to construct, operate and decommission the transmission project. In connection with this process, the Wyoming Industrial Siting Division has identified a geographical area called the "study area," which includes Carbon County and Sweetwater County. TransWest has scheduled three additional open house meetings to provide local governments and the public in the study area with further opportunities to obtain more information about the project, ask questions and provide comments for TransWest's consideration. 4 p.m. - 7 p.m., Oct. 29, The Depot, 400 W. Front St., Rawlins. 10 a.m. - 1 p.m., Oct. 30, Valley Community Center, 255 W. Osborne St., Baggs. 4 p.m. - 7 p.m., Oct. 30, Desert School, 235 Bugas St., Wamsutter. The TWE Project is high-voltage interregional transmission system that will deliver electricity generated by renewable resources and will strengthen the power grid that serves the Western United States. The 730-mile route extends from southern Wyoming to southern Nevada, with interconnections planned in Wyoming, Utah and Nevada. About two-thirds of the project is located on federal land. TransWest has developed the project in a responsible way that avoids, minimizes and mitigates potential impacts to wildlife and the environment, including implementing multiple science-based conservation measures, using designated energy corridors as much as practical, and co-locating the project with other linear infrastructure where feasible. The project was analyzed from 2008-2016 in an extensive Environmental Impact Statement prepared by the U.S. Bureau of Land Management and Western Area Power Administration as joint lead federal agencies. They collaborated with 49 federal, state and local cooperating agencies including Carbon County, Sweetwater County, the State of Wyoming and local Wyoming conservation districts. In addition, BLM and WAPA, along with TransWest, held three public scoping meetings in Wyoming in March 2011 and two Draft EIS open houses in Wyoming in August 2013 (with multiple other public meetings hosted in Colorado, Utah and Nevada). Since the TWE Project's inception in 2008, TransWest representatives also have discussed the TWE Project, received feedback and answered questions at dozens of state, county and municipal public meetings. To review the federal Environmental Impact Statement and BLM Record of Decision, visit https://www.blm.gov/TransWestExpress.